1 Tuner Synchro Monster + 1+ non-Tuner Synchro Monsters Must be Synchro Summoned. Once per turn (Quick Effect): You can banish 1 Synchro Monster from your GY; this card is unaffected by other cards’ effects for the rest of this turn. If this card in its owner’s possession is destroyed by an opponent’s card (by battle or card effect): You can target 1 of your banished Dragon Synchro Monsters; Special Summon it. I want to like this because it’s a good boss monster, just not now. Stardust Chronicle Spark Dragon is a Level 10 Light Dragon-type Synchro Monster with 3000 Atk and 2500 Def. It has to be Synchro Summoned and the requirements are a Synchro Tuner and a non Tuner Synchro Monster. Hopefully, you’re using Dragon Synchro Monsters to summon this so that you can revive them from the banished zone if the opponent destroys this boss monster. The first effect helps with this because it grants effect immunity for 1 turn when you banish a Synchro Monster from your grave. That fuel does not need to be a Dragon, but it would help for the other effect. The problems arise when we realize what time it is. Stardust Chronicle Spark Dragon came out during Link Rules and would take a lot of resources to Synchro Summon properly. For the trouble, you would have conditional immunity on one monster with 3000 Atk. It’s just easier to run Blue-Eyes. At least Alternative can remove a problem from the opponent’s side of the field. There are also better monsters in the Stardust line-up, this one just happens to be more generic. It’s not that this card is bad, it’s just failing at finding a reason to run in the Extra Deck. We are looking at the Circuit Break: Special Edition promos this week, starting with the former Manga card, Stardust Chronicle Spark Dragon. Stardust Chronicle Spark Dragon is an Accel Synchro, requiring a Tuner Synchro and 1+ non-Tuner Synchros for its summon. The only way this guy can be summoned is by Synchro Summon, which is the way you are most likely summoning him, though there are ways to ignore the summoning conditions. Once per turn, during either players turn, you can banish a Synchro from the GY to have Spark Dragon unaffected by card effects for the rest of the turn. Some immediate protection options, you should have 2 Synchros in the GY if you summoned this properly, so you can protect him for two turns at least. 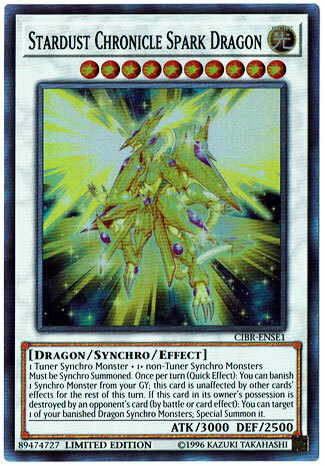 Also if this card in your possession is destroyed by the opponent, you can summon a banished Dragon Synchro. Nice that he can replace himself. Hopefully you use a Dragon to summon this guy. He is somewhat of a more generic Shooting Star Dragon, since Shooting Star requires Stardust Dragon exactly. He is a solid Accel Synchro, but you will more than likely go into Shooting Quasar Dragon, Cosmic Blazar Dragon, or Stardust Sifr Spark Dragon if you can. If you can’t though, and you are using a Dragon Synchro, this guy is a good option. Monsters that can make itself be unaffected by anything are always great, but simply put, Stardust Chronicle Spark Dragon is a figurative dinosaur. Pre-link, there could have been use for him, just like there was use for Number 86: Heroic Champion – Rhongomyniad in warrior decks, but it was a use at best, not a key cog. But now, we live in a new era. One in which the path to the best of bosses is paved with new stones called Link Monsters. Much like Quasar dragon, the demand of players to summon a link monster before even thinking about summoning Stardust Chronicle is far too taxing, especially for a monster with only 3000 ATK. At the very least, Quasar was an unmitigated wall that only Kaiju could realistically topple. But Stardust Chronicle falls to the same wrecking ball. And Synchros inherently hate links anyway, because they don’t have levels. I witnessed a few people come away impressed with Stardust Chronicle after reading the effect, and I looked at them strangely. I think some players are still so ingrained with the old way of playing that they can’t immediately overlook monsters that would have been impressive pre-link. After a year, it still hasn’t fully sunk in with more casual players. Until the game has established a road… no, check that… a monstrous highway between links and pre-link extra deck monsters, lumbering beasts like Stardust Chronicle will never legitimately see the light of day. The game is too fast, and effort to summon something like this is reserved for something that simply can’t be killed.